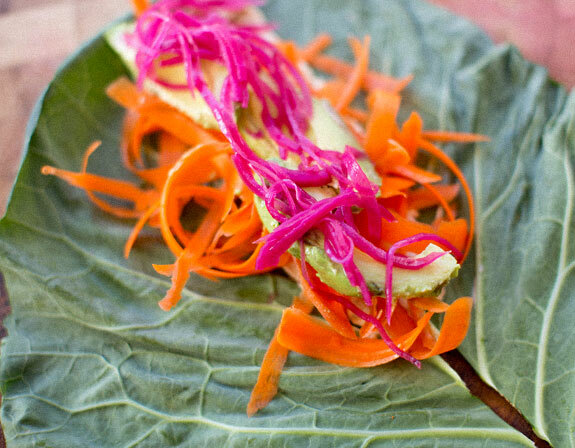 a perfectly raw and tasty lunch- collard wraps! 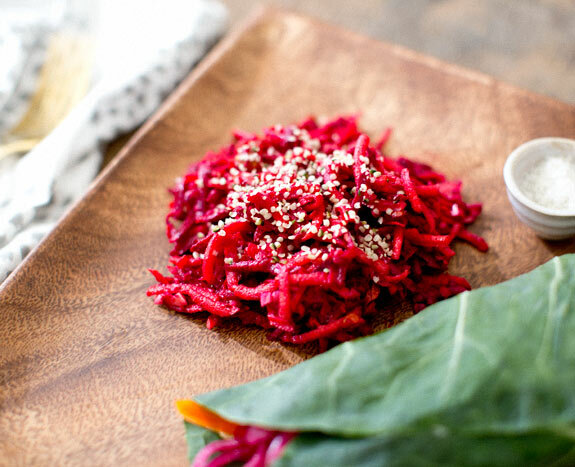 i’ve always been fascinated by raw foodists and what they’re eating. for a few days before and a few days after my cleanse i was eating only raw fruits and veggies and i felt amazing. so i committed to trying to incorporate more raw meals into my diet. or at the very least consume more raw fruits/veggies! this is one of my first attempts at a raw meal. i loved it! and even skeptical beet-fearing lou said “i would eat that” when he tried it. WIN! details and recipe after the jump. 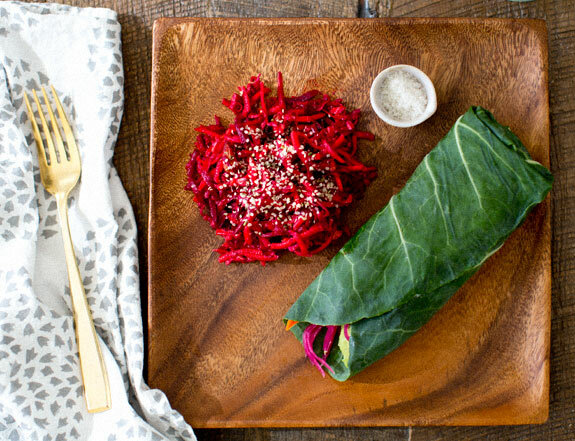 a collard wrap is the easiest thing to make and definitely satisfies in the same way as a sandwich. to make: lay a giant collard leaf flat, remove some of the stem (the part that seems like it will be completely inflexible) and fill with your favorite wrap ingredients. for this one i used a raw hummus (purchased at whole foods), peeled carrot, pickled red onion and lots of avocado! it would also be delicious with tomato, pesto, shredded zucchini and avocado. when you’ve gotten it all in there roll and fold into an open ended wrap. it’s ok if it’s messy- it’ll still taste great! 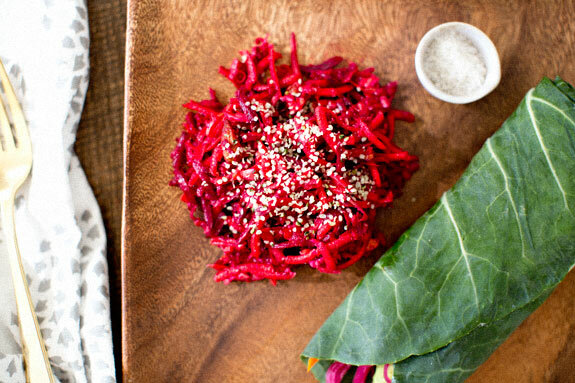 garnish with hemp seeds and if you’d like, a squeeze of lime juice for a kick! Love all the colors! In The Sprouted Kitchen cookbook, there's a really similar recipe that is super tasty! thanks danielle! oooh, i bet her recipe is amazing. still need to pick up that book,. do you love it? Absolutely! The recipes are great and the photography is beautiful!